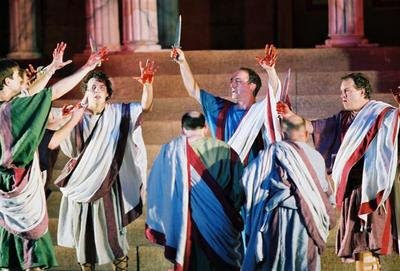 Bloody Caesar! No that's not an editorial comment on a Shakespearian tragedy. 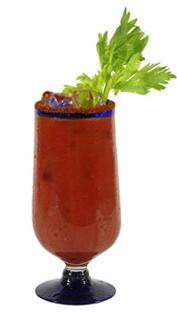 Bloody Caesar is a uniquely Canadian cocktail, invented by a Calgary bartender 40 years ago. The ingredients back then: a mixture of hand-mashed clams, tomato juice, vodka, Worcestershire sauce, salt, and pepper and garnished with a celery stick. Mmm nectar of the gods...well at least of Roman emperors. 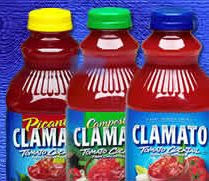 The popularity of the drink has been single-handedly responsible for Mott's fruit juice company raking in the revenues after inventing and then mass producing first Clamato juice - a pre-mixed concoction that replaced the hand-mashing of those clams each time the drink is prepared - and subsequently a Mott's Clamato Ready-To-Drink Caesar. You know, Canada has a long, proud history of inentiveness, associated with our many national symbols. Things like the walkie-talkie, standard time, java programming language, the blackberry, the Canadarm, the electric wheelchair, pablum, and peanut butter. And now, on the 40th anniversary of it's inception there's a move afoot to make the Bloody Caesar Canada's national cocktail. Yep, there's a petition out there aimed at just that. The aim is to present it to Canada's Parliament and to push for legislation proclaiming the Bloody Caesar Canada's national drink. Of course the petition is sponsored by Mott's. So even if the proclamation efforts aren't successful, I'm sure the resulting publicity won't hurt sales. But, hey, good on ya Mott's! And if their efforts are successful? "Friends, Canadians, countrymen lend me your clamato juice!" Did somebody say drink? I'm in. Though I enjoy a caesar, I will not be signing the petition to make it Canada's official drink. I'm sorry, as good as they are, beer is the only thing that can ever be our official drink. FTU: Beauty is in the eye of the beerholder.